The use of wheel cleaning brushes are particularly useful in applications such as the aluminum extrusion process, turbine blades, aluminum wheels, transmission valve bodies, bench grinders, robotic finishing equipment, hand-held grinders and pump gears. The circular shape is ideal for hard to reach areas, and wheel brush sizes range anywhere from small diameter wheel brushes to large wide face wheel brushes that can be used individually or gang-mounted. Typical industries that utilize wheel brushes include automotive, ventilation, refrigeration, aerospace, medical, optics, textiles and electronics. Wheel Brushes Wheel brushes are circular brushes that are commonly used for deburring parts during initial phases of the surface finishing process and polishing during the final phases. Cup brushes are used in similar applications as wheel brushes and are basically strip brushes that are looped laterally to form circular shapes, which are then inserted and adhered into metal cups. The basic wheel brush configuration is that of the wheel hub and the bristles. In the center of the wheel hub is an arbor hole, which is the central hole in a wheel brush through which the arbor fits. An arbor is a spindle or shaft that supports a gear or wheel and an arbor hole is typically either cast or reamed into the wheel hub. Wheel Brushes – Spiral Brushes, Inc. The most common method of construction for wheel brushes is to place a piece of material over holes that are either drilled or molded into the wheel hub, securing that material with a metal staple at each hole, folding the material over and creating bristles. The three materials most often used in wheel brushes include wire, impregnated wire and abrasive nylon. Wire wheel brushes can be made in a crimped or knotted style. The crimped style allows the wire to break cleanly as it wears, increasing the longevity of the brush. The knotted, or twisted, style uses straight wire that is twisted to various specifications in order to progressively increase brushing action control and cutting action aggressiveness. In impregnated wire wheel brushes, the wire bristles are impregnated with a polymer such as polypropylene for additional abrasiveness. 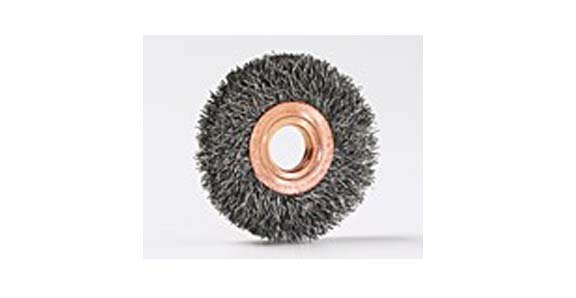 Typical metal wire materials used in wheel brush applications include steel, stainless steel, bronze, aluminum, nickel silver, copper or titanium. In abrasive nylon wheel brushes the nylon bristles are also impregnated for increased abrasiveness, only the nylon is impregnated with grains of materials such as silicon carbide, diamond and aluminum oxide.